Two years ago, director Alfonso Cuarón was at TIFF with his film Gravity. That film was co-written by Alfonso and his son Jonás. Now, Jonás has used that exposure and success as a launching platform to start creating his own films. He was at the festival this year with his latest project Desierto. For it being this early in his career, this illegal Mexican immigrant story is self-assured and confident but ultimately falls short of being a completely successful film. One of the hot-button issues right now in the American south is illegal migrants trying to smuggle themselves across the Mexican border. This film has a simple story reflecting on this experience. 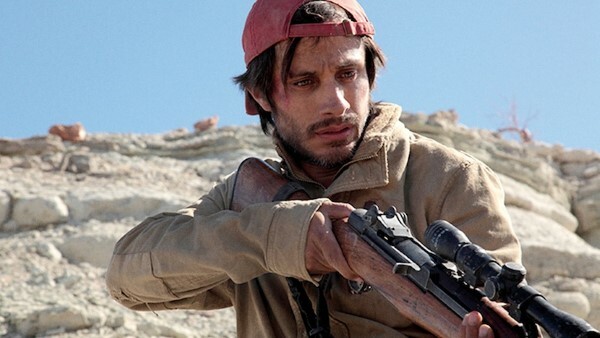 Moises (Gael García Bernal) is attempting to lead a group of Mexican citizens across the border and into America. Having done this before, they rely on him for guidance. The truck transporting them breaks down and they must walk the remainder of the distance. They make it across but now must remain vigilant, as they are illegally on foreign soil. Sam (Jeffrey Dean Morgan) is a local American man who has decided that it’s his patriotic civic duty to act as a border patrol guard (even though he isn’t one) and stop the Mexicans from entering into his country. His trigger-happy attitude combined with his personal world view and racist attitudes creates for a deadly situation for the travellers. He begins hunting them down one-by-one and their journey becomes a race for survival. The film has several incredibly tense and upsetting moments. The brutal and frank nature of these scenes is at times shocking enough that the viewer wants to turn away. The execution style of the deaths is graphic and realistic and the film contains what may be the most disturbing animal death scene in a very long time. Audience members had to cover their eyes and cry out in horror. This has an unsettling lasting impact. The story however is simple and outside of these good moments are bland and basic plot points that don’t add depth to a film that could be timely and provocative. Very little is given about the back stories of these characters or their motivations for wanting to attempt this journey and that leaves the viewer not caring for their safety. The villain characters, Sam and his extremely well-trained dog, are one-note characters whose growth and change through the story is almost non-existent. Sam becomes almost a caricature of the real people his character is representing. The film does present a few moral questions to ponder. How do real people become this hateful? What has happened to them or what have they learned in their lives to become this violent? These are interesting elements to the story but they are not explored in any great detail so the film comes across as a superficial examination of this topic. On the final day of the festival, it was announced that Desierto had been awarded the FIPRESCI jury award for the Special Presentations programme for “using pure cinema to create a strong physical sensation of being trapped in a vast space and hunted down by hatred in its most primal form.” It appears that the film has its champions and the filmmakers are hoping that it shines a spotlight on the plight of Mexicans searching for a better life. However, it could have had a larger impact if the sole purpose of the film wasn’t just the survival journey, but if the viewer had gotten to know the characters and become emotionally invested in their survival. This likely would have given the film more depth and complexity, elevating it out of mediocrity. Jonás Cuarón is a promising new talent but his skills are not quite to level where he can stand on his own without having to rely on the coattails of his father.